SAN JUAN — U.S. Customs and Border Protection’s Air and Marine Operations agents seized 328 pounds of cocaine from a vessel near Puerto Rico on November 15, in what is the latest sign that traffickers may be returning to once popular Caribbean smuggling routes. A CBP DHC-8 Maritime Patrol Aircraft picked up a small, wooden “yola” vessel traveling eastward about eight miles west of Desecheo Island, off the western coast of Puerto Rico. CBP vessels were deployed to intercept the suspect boat, and agents observed two men on board the small wooden ship take packages from a cooler and toss them overboard. Agents reached the vessel and arrested the two men. A search uncovered two compartments on the boat loaded with bricks of what tested positive for cocaine. 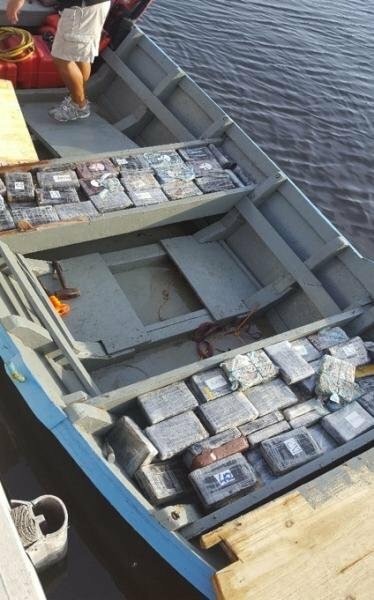 Agents also recovered the two bricks thrown into the water, and the total haul amounted to 328 pounds of cocaine with an estimated value of $4.2 million. This seizure comes less than a month after CBP agents intercepted a similar vessel near Puerto Rico carrying 283 pounds of cocaine worth $3.6 million, and the two incidents appear to be the latest high-value seizure events. Drug-smuggling routes through the Caribbean and into the southeastern United States — South Florida in particular — were heavily trafficked in the 1980s, contributing to an upswing in drug violence in that part of the state. Those trafficking corridors fell in popularity as enforcement efforts increased, and traffickers moved to sea and land routes in Mexico and the Pacific Ocean. But a number of U.S. officials have warned that the smuggling pendulum would swing back to the eastern routes through the Caribbean, and recent seizures would seem to confirm an increase in such activity.